It is hard to believe that half of a 40106 Hex Schmitt Trigger and single AD781 Sample and Hold amplifier IC can produce such a tasty lo-fi sounding effect processor. The circuit, which was developed and published by Tom Bugs on the BugBrand website is nothing short of genius with its utilization of the AD781 to sample, hold, and release a sound wave partial with each clock cycle of the 40106 oscillator. The result of such process is a very good simulation of what it sounds like to reduce the sampling rate from of a source from 44,100 Hz CD quality to 28,000 Hz NES or even lower 8,000 Hz Telephone Quality all in real-time. 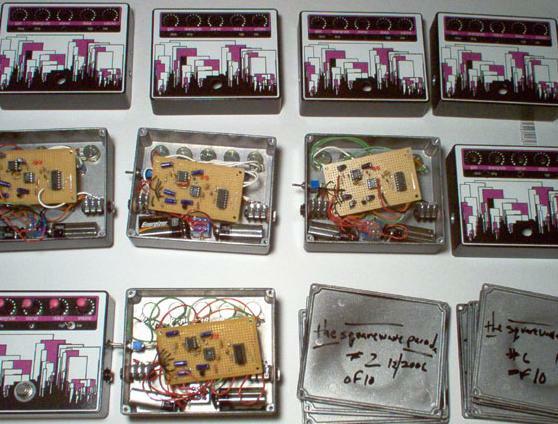 Impressed by the initial results and after weeks spent on research and development Steven of the Squarewave Parade asked Tom Bugs for a permission to modify the design and produce a limited run of 10 units, which are available for sale now. Each unit has been manufactured to be highly esthetically pleasing despite ultra decimating sounds under the hood. Currently each purchase also comes with a free original Suchaturnon.com design T-Shirt. Nice work Steven! Previous PostCircuit Bent Gravity ScaleNext PostGraphite Turntable Sequencer-DJs rejoice!